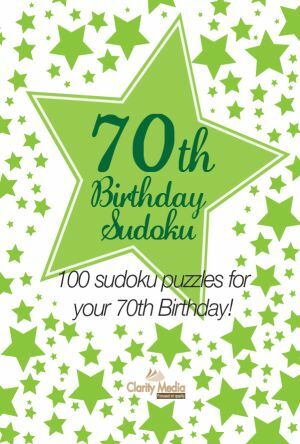 Welcome to the Birthday Sudoku Puzzle Books gift page! If you're stuck for a birthday gift idea but know a puzzle fan, then what better gift could there be than... birthday sudoku? Birthday sudoku makes a wonderful present for someone on their 40th, 50th, 55th, 60th, 65th, 70th, 75th or 80th birthday. So celebrate these milestone birthdays by buying a book of sudokus that all feature this number in all 100 puzzles. How does it work? Well, each book contains 100 normal sudoku puzzles, BUT there are two additional regions in each puzzle that are in the shape of the number of the birthday. 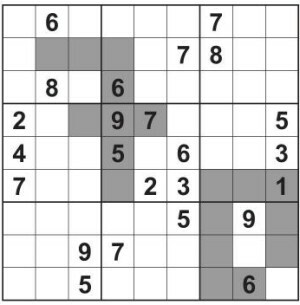 Thus in the 60th Birthday Sudoku book, the numbers '6' and '0' also appear in the grid, and each number must be filled with 1 - 9 exactly once in addition to the standard regions of the puzzle: hence the birthday regions are not just there for cosmetic regions: they form an important additional element to the solving mix! These are proper themed sudoku puzzles, and not just a gimmick. They are also tricky enough that they will be a challenge even for an experienced sudoku solver.For instance, look at the image of a couple of puzzles from the 70th birthday book of sudoku (see image at the bottom right of the page): there are two additional grey regions, for a '7' and '0' respectively, and to solve the puzzles these regions must each contain 1 - 9 exactly once, just like the orthodox rows, columns and boxes in the grid.